Repress on Standard Black Vinyl. Attracting much fanfare and garnering tons of plays by tastemakers, radio stations-in-the-know, and DJ’s alike, the first Electric Peanut Butter Company album was jar-full of ‘60s psychedelic goodness. But guess what? 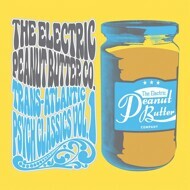 The dynamic duo of Shawn Lee and Adrian Quesada are back with Volume 1 of their "Trans-Atlantic Psych Classics"